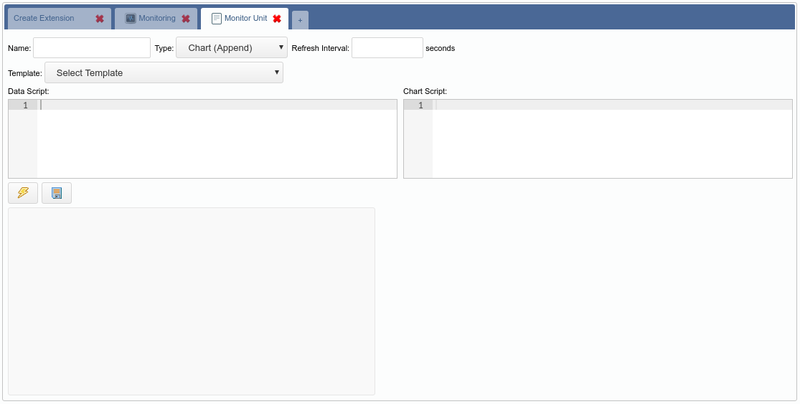 As you can see, this is a new kind of inner tab showing some charts and grids. 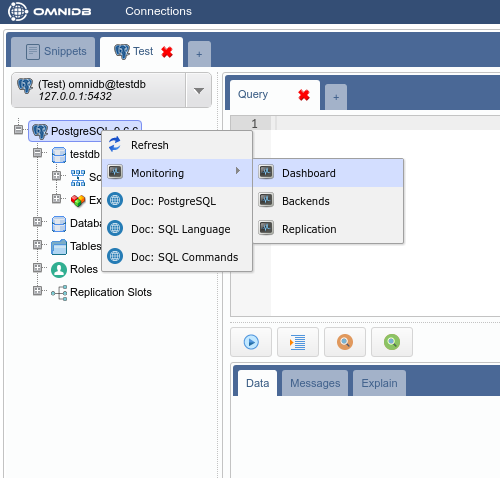 This Monitoring inner tab is automatically opened once you expand the tree root node (the PostgreSQL node). You can keep it open or close it at any time. To open it again, right-click the root node and click on Dashboard. 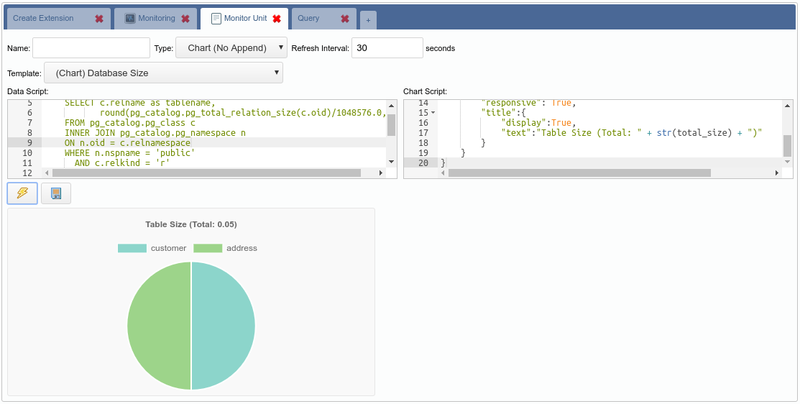 Grid: The most simple kind, just executes a query from time to time and shows the results in a data grid. Chart: Every time it refreshes, it renders a new complete chart. The old set of values is lost. This is most useful for pie charts, but other kind of charts can be used too. 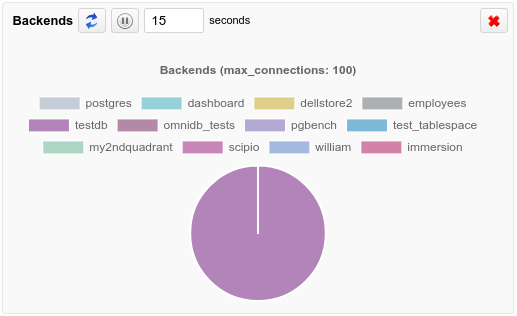 Chart-Append: Perhaps this is the most useful kind of Monitoring Unit. It is a chart that appends a new set of values every time it refreshes. Line or bar charts fit best for this type. The last 50 set of values are kept by the component client-side to be viewed by the user. 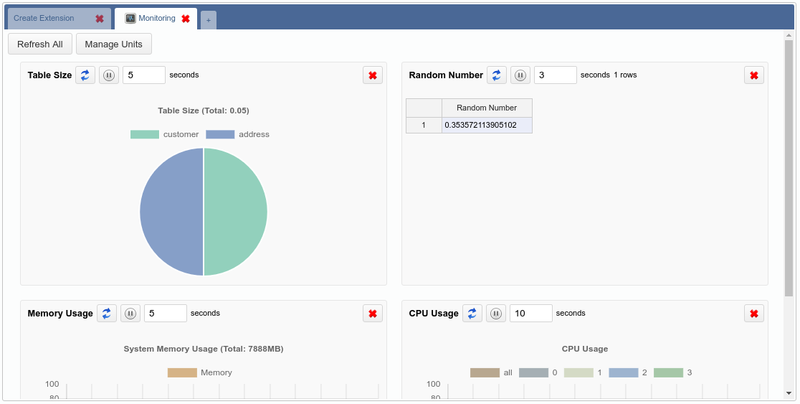 If you click in the button Refresh All, then all Monitoring Units will be refreshed at once. You can also remove undesired Monitoring Units by clicking in the Remove button. To add units to the Dashboard, click on the Manage Units button, and then click on the green action to add the Monitoring Unit you choose. This way, you can add and remove any unit you want to customize the dashboard the way you want. Chart Script: Executed only at the beginning to build the chart. Let us take a look at the Data Script. This template is for a Pie chart. 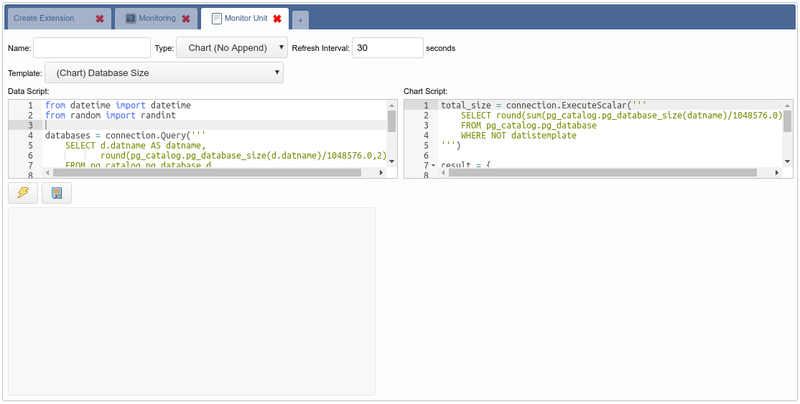 So right now you are probably guessing that you just need to change the SQL query to make the chart behave different. Well, in terms of data and datasets, you guessed right. 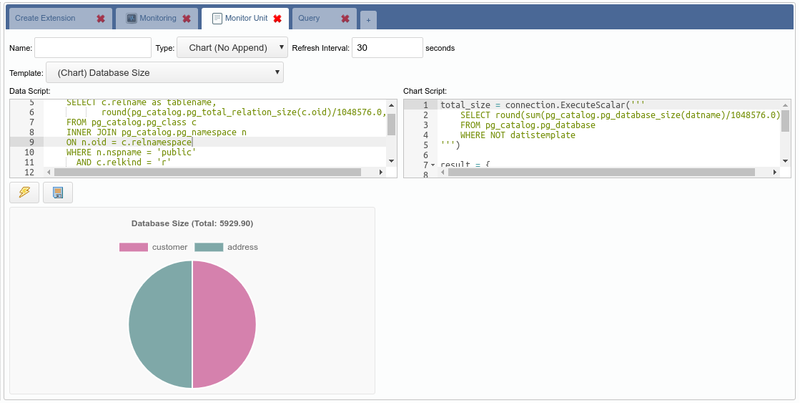 So let’s change the SQL query of this chart to compare sizes of tables of schema public. Also change the references from datname to tablename, as we have changed the column name. "text":"Table Size (Total: " + str(total_size) + ")"
Now that the chart finally works the way we want, we can give it a title, adjust the refresh interval and then click in the Save button. After that we can add it to the dashboard. 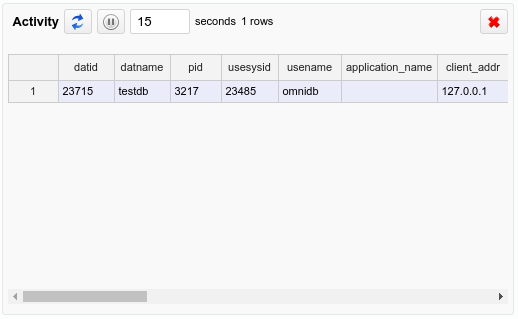 All Monitoring Units that come with OmniDB are open source and available in this repository (feel free to contribute). 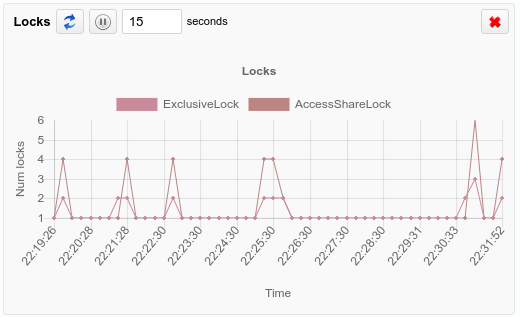 Stay tuned for the next big monitoring feature: Persistent Monitoring!